Clean Room for Medical Manufacturer | Grunau Company, Inc.
A major medical device manufacturer needed a “clean room” built but with one caveat; it needed to be placed inside an existing structure. 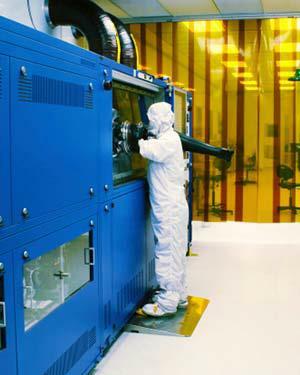 A clean room is typically used when manufacturing a product that requires a low level of environmental pollutants like dust, airborne microbes, aerosol particles and chemical vapors. Due to the amount of equipment needed to “clean” the room of these micro sized pollutants, retrofitting the steel superstructure for the room itself, as well as elevated mezzanines with fall protection and stairs, into an existing building was a real challenge. Grunau Metals was 1 of 3 metal fabricators who prequalified to provide a proposal. We were selected for the project by submitting a turnkey solution. We not only fabricated all of the structural steel components in our shop, but also delivered to the job site. Our own crews then erected the steel components on site. Many other trades were involved as the superstructure was erected, so coordinating the entire project was complex. Next time your company needs something out of the ordinary, Grunau Metals has your solution!